Orange-Yellow Grossular Garnet from Namibia. What a juicy color! Huge gorgeous Juniper Ridge Fire Opal with decorative dendrites and color zoning. Natural Padparadscha Sapphire (heat-treatment only) direct from the mine in Columbia. Natural Pink Spinel from Badakshan, Tajikstan, faceted in my own LoneStar design. 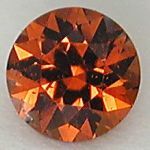 This gem has a unique orangy color that is rare in Spinel.